Using Celcon blockwork in internal partition walls significantly improves sound insulation within a building, particularly when used in combination with beam and block flooring. Music rooms or other quiet areas can easily be designed within a conventional dwelling. Use of Celcon blocks in partitions significantly improves sound insulation between rooms. Celcon blocks are ideally suited for the construction of both loadbearing and non-loadbearing internal walls. These blocks create a more robust partition, adding rigidity to the whole structure, making it less prone to damage than studwork. Celcon blocks also offer excellent fire resistance. A solid partition wall means that there is no build up of combustible material in the cavity, which in stud partitions can generate a flue effect. Normally, masonry partitions should not be supported by timber floors or on timber joists but ideally should either be a continuation of the wall below, where design and layout allow, or be supported by steel or concrete beams, or by concrete floors. However, because of their lightweight properties partitions constructed from Celcon blocks can be supported by timber joists. The joists must be properly designed and sized to suit the span and loading, and the properties of the timber. Use of Celcon blocks in partitions significantly improves sound insulation between rooms. When used in conjunction with beam and block flooring this often avoids the need for additional sound deadening materials when creating quiet areas in a building. 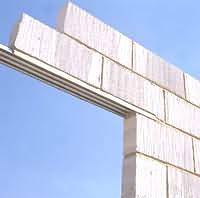 Light-duty lintels may be used when opening widths and loadings permit. The Celcon Thin-joint system is ideal for constructing partition walls. Using Jumbo Plus blocks in conjunction with Celfix Mortar speeds up the construction process, allowing the partition to be finished sooner.